Good news, everyone! I’ve just made a computer nobody’s ever heard of load a program from a floppy disk! Update, 2017-12-08: I actually got this wrong — I mean, it worked, but it would only load programs smaller than 512 bytes (one sector). Turns out that the bootloader in ROM has an exciting bug which needs a workaround, making life much more complex. I’ve updated the document. 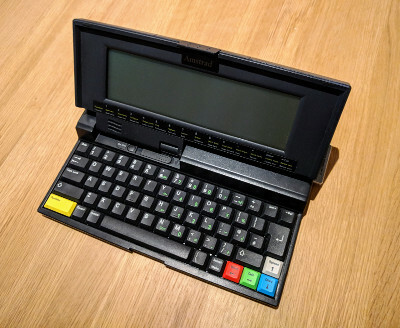 …so the backstory is: I’m the proud owner of possibly one of the best Z80 portable computers ever made, the Amstrad NC200. It’s actually my second, but I forgot to take the five C batteries out of my old one, and they burst and spewed corrosive gunk all over the motherboard, wrecking it. My new one arrived a few weeks ago. I’m not going to go into the history — it’s complicated and I tend to get enthusiastic — but this machine is a Z80 with 128kB RAM expandable up to 1128kB (I have the upgrade), a 720kB floppy disk drive, a pretty good 80x16 character monochrome screen, an excellent keyboard, and would run for up to ten hours on a set of five C batteries (I use a power supply). In onboard ROM was a set of excellent productivity software including a word processor, spreadsheet, and a copy of R.T. Russell’s superb BBC Basic to write your own programs with. The only problem is that as the software’s all in ROM, trying to run, say, a Unix on it is hard. But it turns out that Amstrad put enough escape hatches in that it’s possible. Needless to say, don’t do any of this if you have data you want on your machine. It’ll be a dead loss. The undocumented Function+R key sequence causes the NC200 to load and run a program from a specially-formatted floppy disk. Making such a floppy disk is dead easy once you know the secret, and practically impossible if you don’t. The secret is: it’s a FAT12 filesystem with one extra reserved sector, inside which there is a second copy of the boot sector. If these both look good, then the file called AUTO.PRG in the root directory will be loaded at 0x4000 and run. No, I don’t know why Ranger (who Amstrad subcontracted to do the floppy disk routines) did it like that. That extra reserved sector pushes the rest of the filesystem up by one sector. This means that the DOS clusters aren’t aligned with track boundaries any more. This shouldn’t be a problem, but… Ranger’s software is unable to access these clusters, and will error out if you try to make it access one. So in order to load files which span multiple tracks, you need to mark these clusters as bad so that your file avoids them. This actually adds up to 1/9th of the disk’s capacity. So, what I have is a carefully hand-tooled filesystem image, with all the bad clusters marked in the right place. It’s as small as I could make it and still have enough space for a boot program and two 16kB data files (which is what I need to load Fuzix). The boot block contains a partition table for easy access to the rest of the disk, on which you could put a proper filesystem. The easiest way to create such an image is to use Linux and this precanned boot block. A pregenerated bootable disk image for the NC200. z80asm source code to generate the disk image. …and that’s all you need. The resulting file system cannot be mounted by the NC200’s filer itself — it doesn’t understand the extra reserved sector, and will complain it’s not formatted. But Linux will mount it fine, so use your favourite tool to assemble the program below and copy it onto the floppy, calling it AUTO.PRG. Insert the floppy into the NC200 and press Function+R. It’ll load and run. Note that this program is different to the SRAM example above. Preassembled version of the Floppy Hello World program. We call r_finish in order to turn the floppy disk motor off before starting our program (otherwise it’ll run forever). Just like the SRAM version, you get to use all the standard system calls. This one’s been known about for years; but a lot of the documentation is subtly wrong, however, and is mostly aimed at the NC100, which didn’t have a floppy drive. So I’m focusing on how to achieve this from the NC200 here. The undocumented Function+X key sequence causes the NC200 (and NC100 and NC150) to run a program written in a special format to the SRAM card. To make this work you can either copy the program directly to the card via a laptop with a PCMCIA slot, or use the NC200 itself. I’m going to cover the latter only, because my SRAM card has no battery in it so I have to leave it plugged in or it loses its contents. Preassembled version of the SRAM Hello World program. The binary must be an image starting at 0xc210. The first 3 bytes must be a jp 0xc220 instruction. (The program won’t run if it’s not.) Note that this is not the same header that you need when writing a program directly to the card! To install it, do Function+F to open the floppy drive browser, select the binary with SPACE, copy it to internal memory with C; then, switch to the RAM drive browser with Function+L, format the SRAM card with Menu, F, M, select your binary with SPACE and install it with Menu, T, P.
Once done, you can run the program with Function+X. The first 16kB of the card will be mapped in at 0xc000, in the upper ROM bank, and your entrypoint is called. You can make use of all the native OS services — the OS will bank switch automatically. If you’ve tried any of these, you’ll probably be wondering how to exit the programs. Good news — there’s an easily accessible hard reset function. Turn the machine off with the button above the keyboard. Then hold Function + Stop + <-Del, and press the power button again. The NC200 will beep and wipe its memory, ready for another go. Preassembled version of the diagnostics tool launcher. Copy onto a bootable floppy, call it AUTO.PRG, and it’ll boot and enter the tool. The SRAM version is left as an exercise for the reader. Most programming documentation comes from NC100 IO Specification on cpcwiki, very kindly contributed by Cliff Lawson (the Amstrad project manager). It goes into reasonable detail of all the system call entry points as well as the IO ports, and should be enough to write useful programs. There’s also a NC 100/150/200 IO Specification which just lists the differences between the different machines which is somewhat sparser. Back in 2003ish, I wrote a tool to extract files from SRAM cards (I had a battery in mine back then). This may be of interest to people wanting to recover data. Believe it or not, there is still an NC user’s group.